Join us for a First Friday gallery reception on Friday, May 3rd, from 6:00-8:00pm in store featuring work by student artists at VOICES Corp! 100% of the proceeds from the sale of these works will go back to the students of VOICES Corp! Specifically, their Day Treatment Program works with Court appointed youth and is used as a community alternative to secured detention. Youth participate in educational enrichment, Art Therapy/Cognitive Behavior Therapy, Self-Expression workshops, Life Skills groups, and community engagement projects. Through these programs, youth develop skills in finding employment, emotional regulation, and begin to resolve experienced trauma, while increasing their interpersonal relationships and building a new sense of community. VOICES most recent project has been helping youth to express themselves while inspiring others through art! They have worked on creating paintings that truly represent who they are. 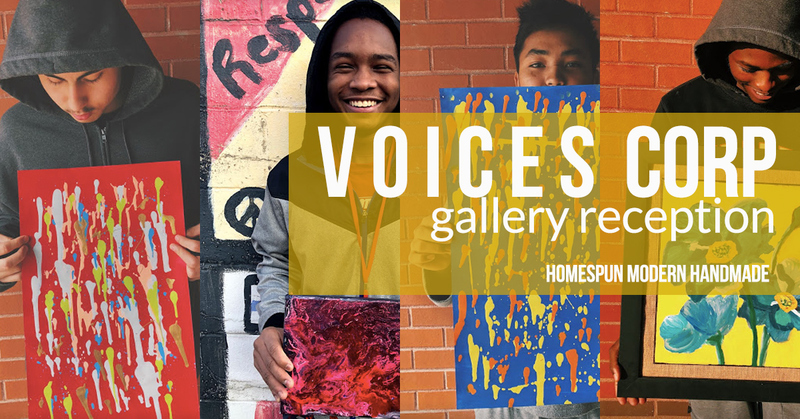 The creation and selling of this art has given the VOICES youth a sense of accomplishment – accomplishing their project, accomplishing a deeper understanding of themselves, and an accomplishment of reaching out to their community. For the youth – and community members – to be able to see their art in local shops is incredibly meaningful and impactful. We hope to see you on First Friday in May to celebrate the work of these wonderful students! We’ll have refreshments in store, and, as always, you can park for free in the lot behind our building!